Philadelphia's elevated Rail Park before the start of a day of service, Friday, Oct. 13, 2017. The first phase of Philadelphia's eagerly-anticipated Rail Park will open on June 14. A ribbon cutting ceremony is slated to occur at 11 a.m. on an elevated section of the park at 13th and Noble streets. The public can access the park by entering at Broad and Noble streets. The opening will bring to fruition a vision years in the making. 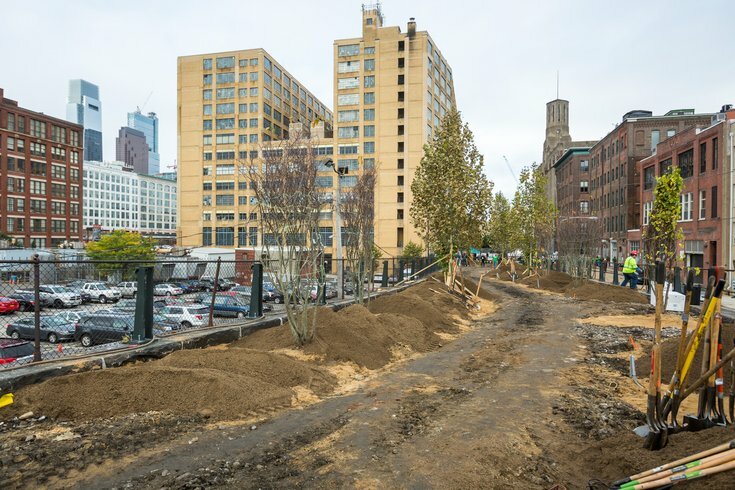 Built on top of the former Reading Railroad viadcut in Callowhill, the park will stretch a quarter-mile from Broad and Noble to the 1000 block of Callowhill Street. Inspired by New York City's High Line, the Rail Park is landscaped with dozens of trees, including canopy and understory varieties, and more than 1,000 shrubs and and perennials, such as Virginia Sweetspire, Ostrich Fern and Spiecbush. Eight hanging planters will hold native grasses and spring bulbs. The views from the 25,000 square-foot park will feature an abundance of industrial buildings that display architectural styles dating back to the mid-19th century, when Callowhill served as a manufacturing hub during the Industrial Revolution. The Reading Railroad viaduct, constructed in the 1890s, once transported both passengers and freight to and from Center City. But trains ceased running along the viaduct in 1984, leaving it unused for decades. Now, it is being revived, thanks to the Center City District and Friends of the Rail Park, a nonprofit conducting fundraising and advocacy efforts. Construction on the first phase began in October 2016. It initially was scheduled to open this spring, but its debut was pushed back after questions arose regarding the structural integrity of a 130-year-old bridge. That bridge, which serves as the primary entrance, is being renovated. Eventually, the Center City District intends to extend the park another mile along the viaduct to Fairmount Avenue and Ninth Street. At its grandest vision, the park could extend westward through a below-street-level stretch known as The Cut and an underground stretch known as The Tunnel. The Cut, an open-air segment, would run along abandoned railroad tracks stretching from Broad Street to the back of the Rodin Museum at 22nd Street. The tracks are bordered by 30-foot, stone walls and run beneath various city bridges. The Tunnel is an abandoned railroad tunnel running beneath Pennsylvania Avenue from 22nd to 27th streets. Naturally illuminated, the tunnel is 50 feet wide and lined with stone walls. It is supported by vaulted brick ceilings that reach 25 feet high. If those segments ever become reality, the Rail Park will stretch three miles from Philadelphia's Callowhill to Brewerytown neighborhoods.